PNC Park in Pittsburgh, which opened in 2001, is considered by many to be one of the most beautiful ballparks in the MLB so I went in with high expectations. As for the exterior, it is the first ballpark to be built primarily of limestone and it contains unique steel trusses. While it is certainly an attractive park inside, it doesn’t have many distinctive features that are often found in newer ballparks. 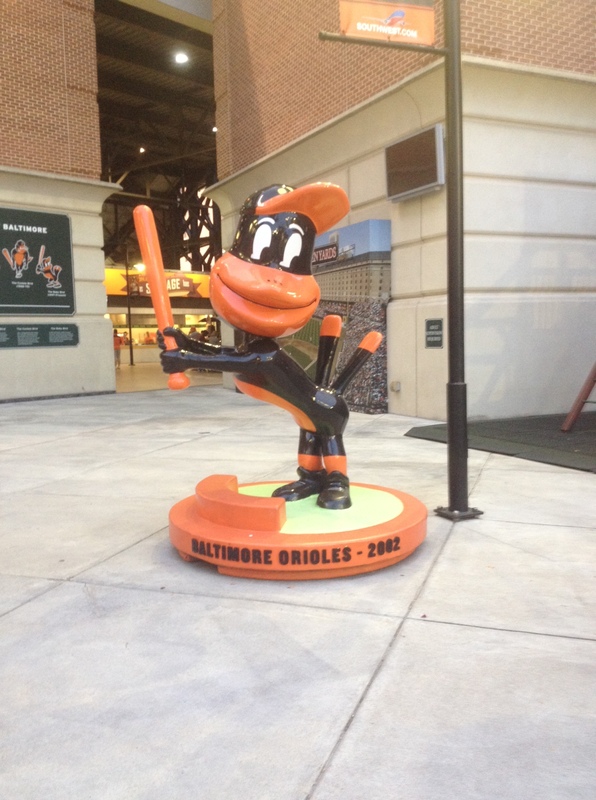 There isn’t a center field sculpture like in Marlins Park in Miami or a big mitt like in San Francisco’s AT&T Park. However, what makes PNC Park special is its setting. It is located right along the north shore of the Allegheny River next to a bridge which was renamed the Roberto Clemente Bridge, in honor of the Pittsburgh Pirates‘ Hall of Fame player from the 1960’s and 1970’s. I was eagerly looking forward to the game since I’m an avid Chicago Cubs fan. I always feel compelled to point out that I have supported the Cubs long before they became really good and won the 2016 World Series, their first since 1908. As we entered the stadium, it was quickly apparent that there was a huge contingent of Cubs fans who had made the seven-hour trip from Chicago, since it seemed that at least one out of five fans in the ballpark were Cubs fans. This may have had something to do with the Chicago Cubs leading their division while the Pittsburgh Pirates are currently stuck in fourth place. It was primarily a pitchers’ duel between the Cubs’ José Quintana and the Pirates’ Jameson Taillon. The Pirates tied it in the sixth inning setting up late-game drama. The Pirates’ third base coach, Joey Cora, ended up playing a major factor in the game. With the tying run already in, the bases loaded and one out, Josh Bell hit a fairly deep fly ball to left field which should have scored the go-ahead run. However, Cora inexplicably decided not to send Gregory Polanco from third base. Schwarber is tied for the league lead in outfield assists which clearly played into Cora’s decision. However, Schwarber’s throw was off line and Polanco would have scored easily, if sent. In the 7th inning, the Pittsburgh Pirates’ Starling Marte hit a ball into the left field corner with pinch-runner Greg Newman on first base. Cora, maybe trying to make up for the prior inning’s gaffe, sent Newman home. The relay throw from Schwarber to Baez to Contreras was a thing of beauty and Newman was out by a hair. The Pirates demanded a video review, but the tape revealed that Newman was indeed out, even though just barely. Baseball is a game of inches and this was just one more example. While I was thrilled as a Chicago Cubs fan, I felt tremendous sympathy for Cora. He seemed truly despondent and the Pirates faithful let him have it with heckling from all around me. The fans were quite brutal to him. As sad as I was as a Cubs fan, there is truly nothing more exciting (as a baseball fan) as the walk-off home run. Frazier was mobbed by his teammates with the traditional Gatorade shower. Pirates fans went home truly happy, if only for one night. and it also reflects those two parks with its center field bleachers (like Wrigley) and left field wall (though only 14 feet high vs Fenway’s 37 foot Green Monster). What is puzzling is why the Texas Rangers felt the need to build a new $1.2 billion ballpark right across the street, especially since the Rangers’ current stadium was built relatively recently, in 1994. The new Globe Life Park under construction will be the new home of the Texas Rangers beginning in 2020. In many ways, I prefer the older ballparks to the newer ones primarily because of their history. I can understand it if a ballpark has become run-down like Shea Stadium, former home of the New York Mets, but otherwise, I’d opt for a facelift of the old park rather than spend over $1 billion for a new one. Nevertheless, one huge advantage that the new ballpark will have is a retractable roof. For heavy rainstorms or the oppressive heat that is common in Texas in the summer, this will be a huge benefit. As part of the pre-game, the Rangers honored their own Bartolo Colon for recently becoming the winningest pitcher from Latin America, with 246 wins. At 45 years old, Colon’s skill amazes me every time I watch him pitch. Although Colon has primarily only one pitch, it has late movement that baffles hitters. when the PA system announced that severe lightning and quarter-sized hail were approaching the stadium. The fans scrambled for cover. While we never saw the hail that was mentioned, the skies did open up for over an hour with torrential rain as I had never seen before. It appeared as if a rainout was in the cards as the outfield looked like a swamp and the warning track was like a river. Shockingly, the field drained incredibly well and the grounds crew did a laudable job at getting the field ready for the game. An hour and a half later, the teams were playing baseball. This game featured pitchers Andrew Heaney of the Angels and Martin Perez of the Rangers. Neither pitcher is having a great year so, despite the ongoing rain, we were prepared for a slugfest. The two teams did not disappoint on that expectation. The Rangers struck first in the opening frame but the Angels responded quickly. Albert Pujols hit a long drive to center field to give the Halos a 2-1 lead in the second inning. Pujols has been one of my favorite players since I was 7 years old. During a spring training game that I attended in Florida, I eagerly got my way to the front of a crowd of autograph seekers and snagged his signature on a ball that I prize to this day. I still remember how gracious and classy he was when I met him in person. Pujols’ 430-foot home run was #633 of his hall of fame career and I’m glad that I saw him hit another homer before he retires. The Angels’ lead grew to 6-2 in the fourth inning, but the Rangers strung together several hits in the bottom of the fourth to tie the game at 6. In the top of the 7th, the Angels retook the lead and then sent up rookie phenom Shohei Ohtani to pinch hit. Ohtani has taken the league by storm since arriving in the majors from Japan earlier this year. It is a very rare phenomenon that he is both a terrific hitter and pitcher, doing both at superstar levels. At only 24, he has a very bright future ahead of him. I was anxious to see him in person and he didn’t disappoint. He slugged a three-run homer putting the Angels up 11-6 and the Angels ended up winning the game 11-7. Pujols may be approaching the twilight of his career, but he is still able to perform at a high level while Ohtani is just at the dawn of what is sure to be a wonderful career. I was thrilled that I was able to witness this game. I look forward to coming back to Arlington, Texas when the new Globe Life Park opens in 2020. I had been to Yankee Stadium once before, but I was only 10 years old so I couldn’t fully appreciate the history of the Yankees at the time. Considering that it was also 100 degrees on that summer day and that the Yankees lost, it wasn’t exactly a perfect day at the ballpark. I was sitting in short right field which is prime home run territory since right field is only 314 feet from home plate. I have caught a couple of foul balls over the years, but never a home run, so I put on my glove and was looking forward to the possibility. Having watched some of my favorite players, like Mariano Rivera and Derek Jeter, in this ballpark since I was little, I felt those memories resurface when I arrived. Yankee Stadium was totally re-built in 2009 so there isn’t the history of what they used to call it – the “House that Ruth Built” – where other famous players like Joe DiMaggio or Mickey Mantle all played. They played in the original building that was built in 1923 and was torn down after the 2008 season to become parking. For $2.3 billion, the Yankees built a new stadium and the architects appeared to try hard to replicate many of the original features such as the limestone exterior, the copper frieze on the upper deck and Monument Park beyond the center field fence. It lacks the charm of Fenway Park or Wrigley Field but it is still nicely done. The Yankees were having a very good season this year but had suddenly embarked on a 7-game losing streak so there was a sense of pressure to get back on the right track and beat the Angels tonight. It was the bottom of the second inning when Didi Gregorius launched a home run to right field. Fun stuff. I miss his calls for some of the retired players like “A-Rod with an A-bomb!” for Alex Rodriguez or “the Giambino” for Jason Giambi since they called Babe Ruth the Bambino, or my favorite, “The Melk Man Delivers” for Melky Cabrera. Martin Maldonado tied it for the Angels in the 4th inning with a home run to left field which occurred immediately after a balk was called on Yankee pitcher Jordan Montgomery, who had been pitching brilliantly. This may have unnerved Montgomery even though one is supposed to simply forget about it. In the Yankees 5th inning, Matt Holliday smacked a home run to right field. and 2 more in the 7th inning cruising to an 8-2 lead. Martin Maldonado hit his second home run for the Angels, but they could get no closer so it was an 8-4 final score. Maldonado’s homer was also to right field but this one was a dozen rows away so I was not going to get my home run ball after all. Nonetheless, it was a great night at the ballpark with a good friend of mine and we enjoyed the game immensely. The rain started falling in Fenway almost immediately after the game went into extra innings. With each inning, the rain intensified and it bordered on torrential as the game entered the bottom of the 12th inning with the Red Sox at bat. The diehard, drenched Bostonians who stuck around (almost everybody) were rewarded with a walk-off victory over the Phillies when 22-year old Andrew Benintendi smoked the winning hit. He was very animated after the hit when his teammates mobbed him as they greeted him on the field. The Red Sox accomplished a walk-off the previous night (by Dustin Pedroia) over these same Phillies, and also in extra innings, so it’s been an exciting couple of days for Sox fans. I had never been to Fenway Park before and my first visit didn’t disappoint. Fenway Park is rich in history. Opening in 1912, it is the oldest existing MLB park. In that first year, Fenway hosted the World Series – one of the most exciting World Series in MLB history! Virtually all of the games in the Series were close: four of the games were decided by only one run, another was decided by only two runs, and one game ended in a tie. Two of the games in this Series went into extra innings, including the final and decisive Game 8. This 1912 World Series was the only best-of-seven Series to go to eight games since game 2 was a tie gam, called on account of darkness. The Green Monster in left field looks daunting on TV and it was exhilarating to see it up close. It is 37 feet high but only 310 feet from home plate. When Aaron Altherr of the Phillies hit a home run over the Monster to tie the game at 2 all in the 3rd inning, it was quite a site to witness. David Price was the starting pitcher for Boston. He is a lefty like me and I had the perfect view of his mechanics from our box seats in short right field. His form and delivery are flawless and, except for that 2-run home run by Altherr over the Monster and one other run, he deserved to win the game. Then again, Phillies’ rookie pitcher Ben Lively matched Price by only giving up 3 runs in his 7 innings. The Red Sox hitters were getting runners on base, but they just couldn’t drive them in since they stranded 12 runners on base. The Phillies’ hitters were even less effective, leaving 13 runners on base. Both teams did not capitalize on scoring opportunities which caused the tension to build with each passing frame. The middle of the eighth inning followed with the traditional playing of the Neil Diamond song “Sweet Caroline”. The crowd seemed to all be singing at the top of their lungs without inhibition. Even I sang along! The rain started soon after that though. I didn’t mind but my Mom decided to don her rain poncho – which happened to be a New York Mets’ poncho. How embarrassing. Besides the winning hit, Benintendi stroked two other hits. It was inspiring to see a near-rookie receiving the hero treatment at the end of the game and I was very happy for him. While it was almost midnight when we left the stadium, it was definitely a thrilling night and Fenway is now one of my favorite parks. Visiting Citi Field for my 16th birthday, we had incredible seats – right behind the dugout. Since this was my first visit to Citi Field, I was looking forward to a beautiful June Sunday. However, this was not the case, as it almost immediately started to rain, and persisted until the end. Even though the rain was not enough to cause a delay or cancellation, the Mets did not seem to take advantage of the opportunity to be able to play. It has been a disappointing 2017 season for the Mets so far since they came in with high expectations after making the playoffs in the past two years. Heavy injuries, particularly to the pitching staff, have weighed on the club. For that reason, Tyler Pill made his first lifetime major league start. Who? Yeah, exactly. Pill gave up a run on three hard hits in the first inning and this turned out to foreshadow his day as a whole. suddenly the umpires ruled that the Mets had not touched second base on the double play and the replay proved them correct. Before video replay, this was the “neighborhood play” as the second baseman or shortstop wouldn’t have to touch second base – just putting his foot over the bag was enough. Well, with video replay, that unwritten rule went away. Anyway, the crowd booed vehemently and the Pirates tacked on another run before the 7th inning ended. The good news? We got to sing “Take Me Out to the Ballgame” a second time and I got to see myself on the Jumbotron. That extra run seemed to deflate both the crowd and the Mets. The last runs were scored off Met reliever Josh Smoker, who was lit up and burned for the last three runs for an 11-1 final. 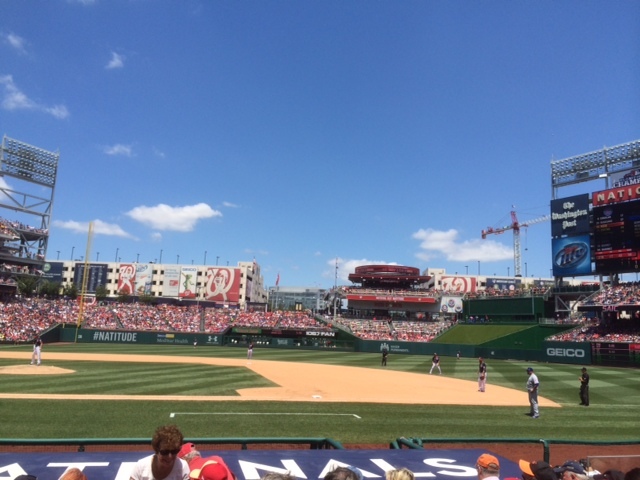 It wasn’t the backdrop for a game on my birthday that I had imagined, but I was with friends and family so it was still “a great day for a ball game”. Thomas Jefferson wrote the Declaration of Independence. July 4th is his day. You would think that he would be given a break. 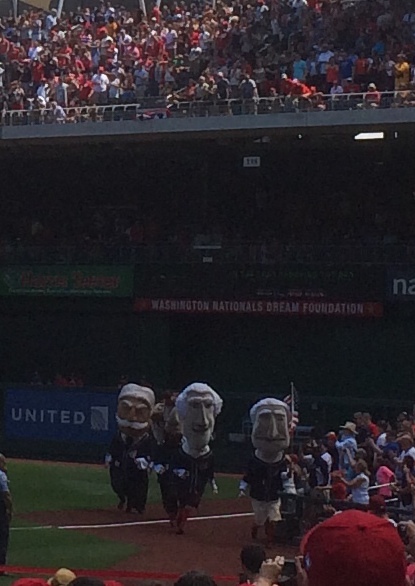 However, coming down the stretch of the famous President’s Race held between innings among Jefferson, George Washington, Teddy Roosevelt, Abraham Lincoln, and William Taft, Jefferson relinquished the lead in the stretch, and George Washington was victorious. The crowd loves this silly race of 12 foot high paper mache-clad people that is held between innings of Nats’ games from time to time, and I admittedly do too. Oh yeah, what about the baseball game? The Cubs won 7-2. Nationals Park is quite impressive. 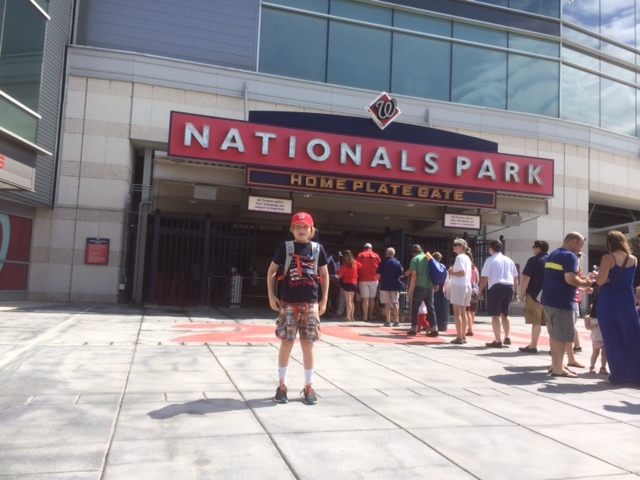 I have attended a game at RFK stadium, where the Nationals played until 2008, but since I was only 6, I can’t say I remember very much. 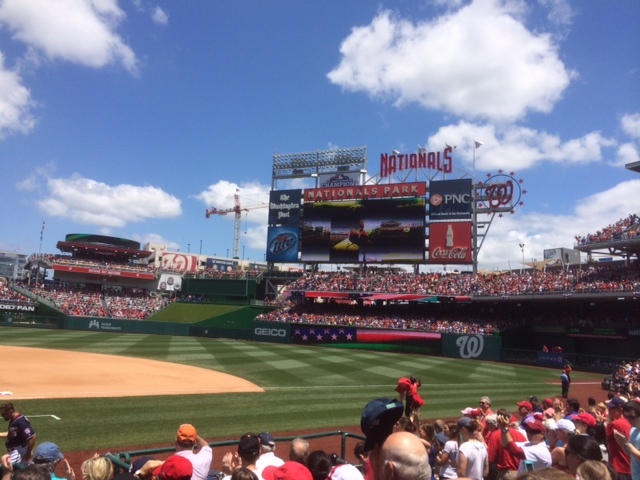 Nats Park is like many of the new parks which try hard to incorporate many of the bells and whistles in ballpark technology on their scoreboard. Multiple signs about “Natitude” abound. It reportedly cost over $700 million to build the park which is a number which is hard to get your head around when you consider that that comes out to $16,900 per seat assuming the 41,418 seating capacity. While there is a lot to like about the Park, it doesn’t evoke the same charm as Camden Yards, or have any unique features like the monstrous baseball glove at AT&T Park. Again, no complaints, just nothing very unusual. We had just settled into our seats in the bottom of the first inning when Jason Werth hit a very long bomb to left field to tie the game at one. 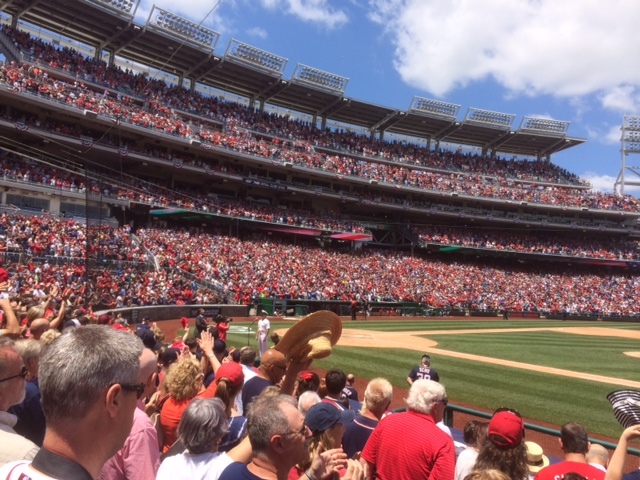 After every home run, a navy submarine dive horn sounds, which is a nod to the park’s location in Navy Yard. That home run was one of the few mistakes that Jason Hammel, the Cubs’ pitcher, made. Little did everybody know, this was Hammel’s last game as a Cub as he was traded with fellow Cubs’ pitcher Jeff Symardjia to the Oakland A’s for three minor league prospects. This is the one thing as a diehard fan that is hard to swallow. I get that the Cubs are building for the future, but if you are a season ticket holder and paid good money to go to every one of Hammel’s and Symardjia’s games, you have to be pretty ticked off that management has essentially written the season off on the Fourth of July. As for the rest of the game, despite one of the worst hitting line-ups that you see in the majors, the Cubs somehow scraped together 7 runs while Hammel and the bullpen shut down most of the big guns on the Nats with the exception of Werth. Both Bryce Harper and Adam Laroche went 0 for 4 and didn’t look good doing it. Harper in particular looked out of sync as if he is still shaking off the rust after returning last week from injury. Hopefully, it is only a matter of time until he is back to his dominant self. As for the Cubs, I’m not sure how you can win with a lineup whose batters #4 through #8 are Starlin Castro, Luis Valbuena, Nate Schierholtz, John Baker and Darwin Barney. Castro is the one solid hitter in the group, but batting clean-up? He is a singles hitter. Valbuena is a journeyman who also has little to no power. And Scheirholtz, Baker, and Barney won’t be confused with Murderers’ Row. With all of that being said, while it will indeed be a painful couple of years for Cubs fans, I just read that the Cubs’ farm system was ranked number one in the majors. Theo Epstein, the Cubs’ general manager, did engineer two World Series titles for the Boston Red Sox, albeit with a lot of pieces already in place, so he clearly knows what he is doing. So hope springs eternal! The best part about Nationals Park is its proximity to so many other attractions. We visited the National Air and Space Museum downtown as well as the Hirschhorn Art Museum. 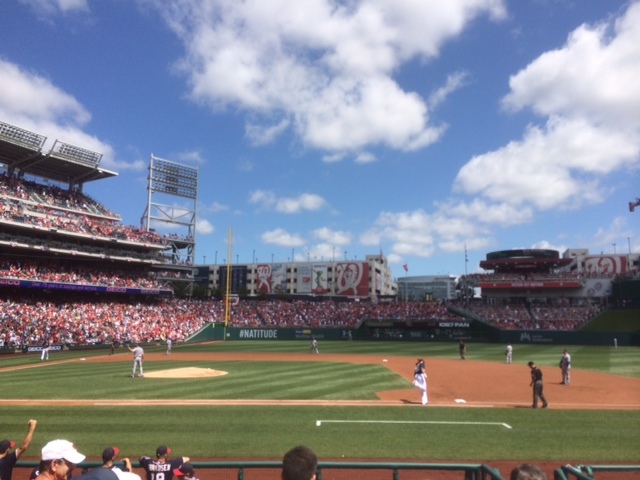 I hope to return again as the Nationals will surely be pennant contenders for years to come. While people have told me how nice Camden Yards in Baltimore is, after witnessing it first hand, I can see why they raved about it. Although it was constructed in 1992, it still feels like a new ballpark, while the use of old style brick gives it a lot of charm. The huge 78 foot long by 50 foot high scoreboard is very cool even though a few of the recently built parks have since copied this feature. 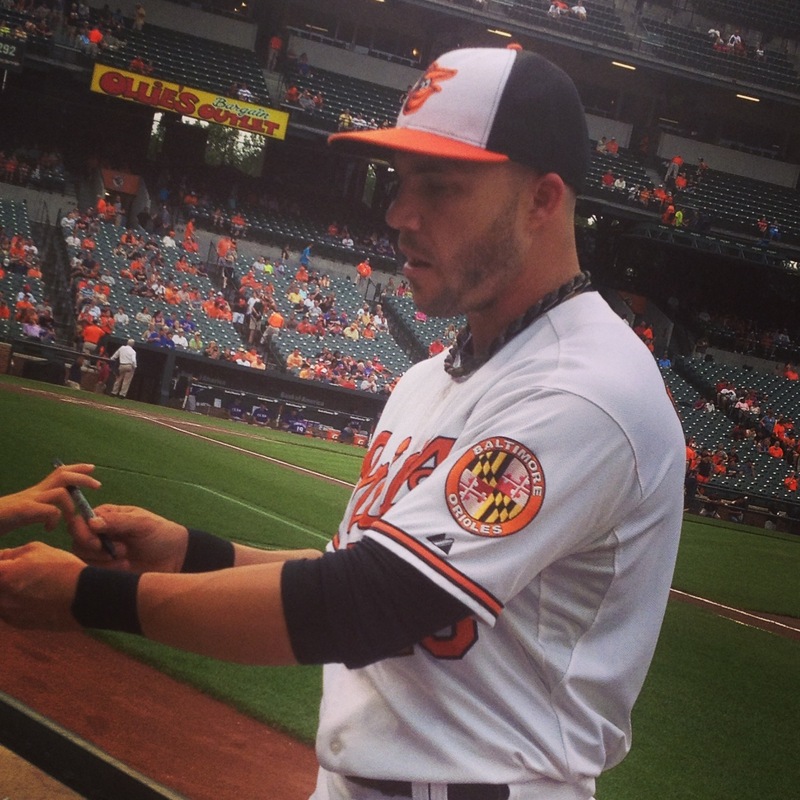 Having arrived at the game early, I had the opportunity to get an autograph from Steve Pearce – the Orioles’ hottest hitter. This game was played on one of those hot, sticky July days when the mercury tops 90 and you start sweating just by sitting. Thunderstorms loomed close by from the very first pitch. While I wanted to root for the home team Orioles, part of me did want to see the Texas starting pitcher, Miles Mikolas, do well. After all, it was his first major league start, and I imagined the nerves that I would feel if I were in that situation. He is a big guy at 6 foot 5, and if he was nervous, it didn’t show. For most of the game it was Miles’ night. He rolled through five innings, giving up only one run (on an Adam Jones homer), walking none, and striking out four. 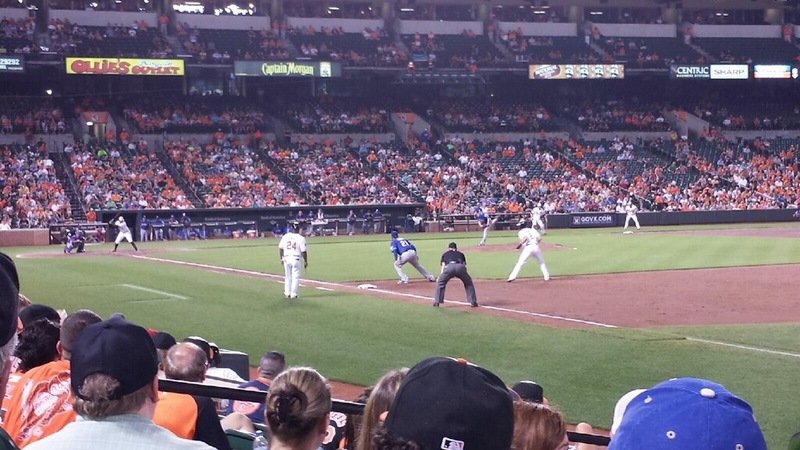 Meanwhile, Orioles’ starter Chris Tillman struggled so the Rangers stormed out to a 4-0 lead in the third inning. It looked like a fairly dull game until everything changed in the bottom of the sixth inning. With the Rangers up 4-1, suddenly Miles looked shaky. After one out, he walked the next batter on four pitches. “Uh-oh”, my Dad said, “he’s starting to lose it. Maybe they should yank him before the wheels come off.” After Miles walked yet another batter, the manager did finally replace him with Jason Frasor. 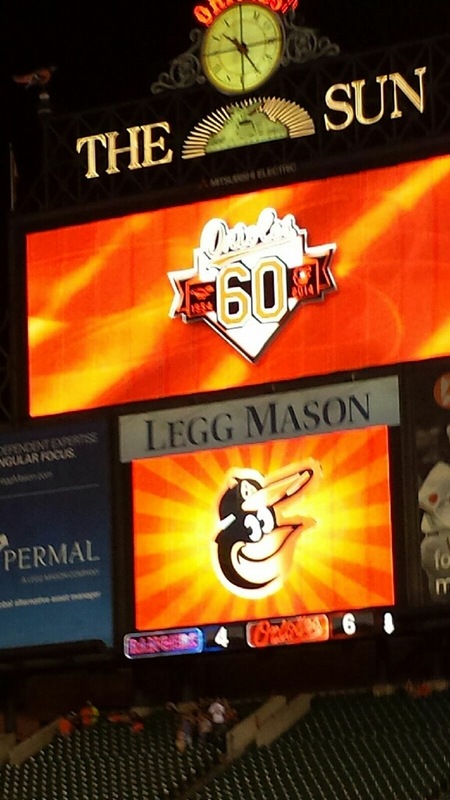 The Orioles rudely greeted Frasor with a sacrifice fly, a single, a walk, and another single, and the game was tied! Miles would not be getting a win in his first start. The game, however, was suddenly exciting. 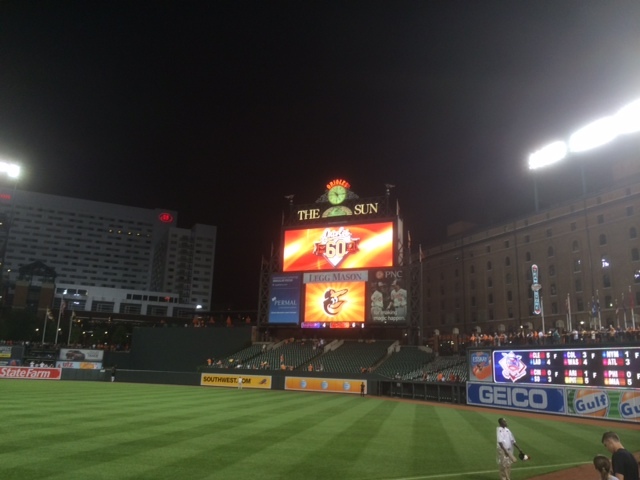 After a rousing 7th inning stretch, the Orioles’ fans anticipated the best. At the plate was the light hitting infielder, Ryan Flaherty, batting .205 and known more for his glove than his bat. Suddenly, that unmistakable sound of a wood bat hitting a fast ball squarely on the sweet spot echoed throughout the stadium. 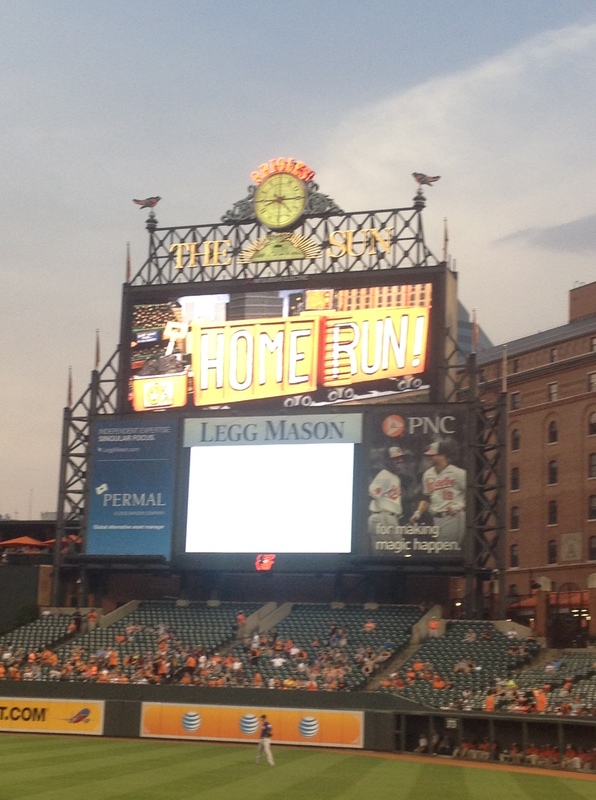 Flaherty hit one of the longest home runs that I have ever seen. It headed over the seats and Boog’s BBQ towards the B&O Warehouse. Unfortunately it caromed off a pole stopping its trajectory or it would have been interesting to see how far it would have traveled. The crowd oohed and aahed. The Orioles then scratched out another run to make the score 6-4. In the bottom of the 8th, the grounds crew swiftly poised themselves by the tarp on the side of the field. It was perplexing as it did not seem any more likely to rain at that moment than during the previous seven innings. Well, they must have received some good information because the skies opened up. Everybody scrambled for cover! After a one hour and 38 minute rain delay, the game resumed. Orioles’ closer Zach Britton retired the Rangers 1-2-3 for an anticlimactic ending in front of the diehard 200-300 fans who stayed until the bitter end. 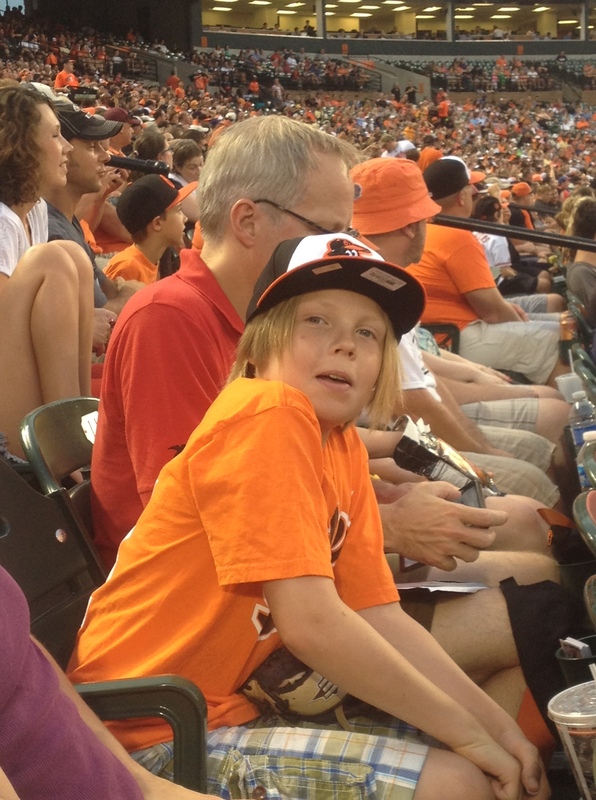 I really look forward to returning to Camden Yards next year. Since my sister will be studying at the University of Maryland, it is very possible. bob ciccarone on We’re off!!!! Gabrielle Figueroa on Go, Cubs, Go!